The Isolde Quartet will perform on Show 313 in Boston, MA, recorded on October 4, 2015. The Isolde Quartet is based at the New England Conservatory Preparatory School in Boston, Massachusetts. Its members include 18-year-old violinist Kate Arndt from the Boston area, who first appeared on From the Top Show 267 in 2013 in Boston, Massachusetts; 16-year-old violinist Tristan Flores from Lexington, Massachusetts, who first appeared on From the Top Show 285 in 2014 in Boston, Massachusetts; 16-year-old cellist Zlatomir Fung from Westborough, Massachusetts, who first appeared on From the Top Show 283 in 2014 in Boston, Massachusetts; and violist Gerald Karni from Lausanne, Switzerland. 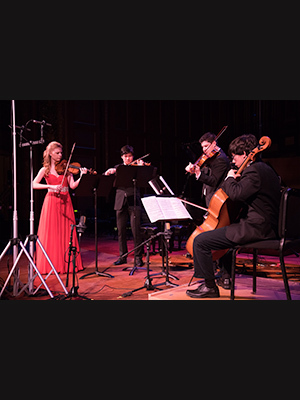 In 2015, the ensemble received an honorable mention at the Fischoff National Chamber Music Competition.